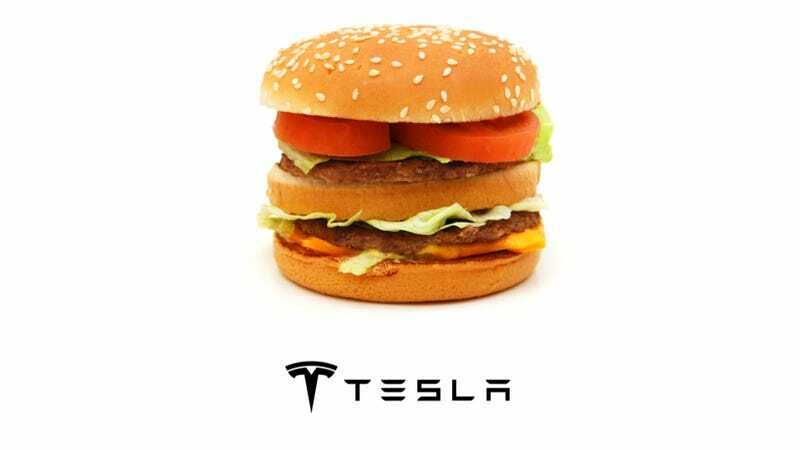 How Many Big Macs Does It Take To Power A Tesla Model S? For all the handwringing the world does about the Tesla Model S and its whiz-bang electric battery, we tend to lose the plot about what the car is all about: America. And while America needlessly worries about the battery, America should instead think about something else it loves: Big Macs. Earlier in the week, our esteemed Jason Torchinsky wondered if it would be possible to run a car off the fat encasing our patriotic American bodies, using liposuction to directly power the engine. For the more doughy among us, it's an enticing idea for our post-petroleum future. Just attach a hose to my sides at one end and to a motor at the other, and away we go. But for the rare breed that possesses love, but not handles, it presents a conundrum. They, too, would like to roam the Earth after Peak Oil, but with no bountiful reserves to power their oil burners, they'll be stuck on bikes. And there's the answer! A bike. But a bike can't really hold four people and their stuff, so you're going still going to need a car of some sort. A car that can be powered by said bicycle. Unfortunately I have yet to discover how to turn maniacal pedaling into pure gasoline, but there are bicycle-powered generators that turn your furious pumping into pure electricity, so the Tesla Model S presents itself as a wonderful solution to our conundrum. But how do you power a Tesla Model S using nothing but yourself? How long would it take? How many calories would you burn? How many Big Macs would you need to provide those calories, as you are an American, powering an American car, and that is all you eat? And how much would that cost? For our purposes, we're going to need to make some assumptions. Let's assume that you can trickle-charge a Tesla Model S from a bicycle generator; there's no charge loss from the Lithium-ion batteries; a relatively fit person named Nikola for ease of use; who should be able to put out 100 watts per hour, or .1 Kilowatt-hours; that this person doesn't need to sleep ever because those are my rules but they still need to sleep; and they don't need to take breaks to go to the bathroom or anything because we've hooked up some sort of bag or something, I really don't want to get into the details. Oh, and let's plunk old Nick and the bike in front of a TV playing re-runs of Bonanza so he doesn't get bored. What a show that was. You can think about it as an automotive equivalent to the Drake equation, so you can play with your own variables and assumptions as you like. So off Nick goes on his bike, pedaling away merrily. The Tesla Model S is sold with a battery that is standardized at 85 kWh (edit – though the Model S Calculator goes up to 97.1), so we'll have him pedal while we figure this out as he's got a ways to go. At a rate of .1 kWh, Nick's going to be have to be pedaling for quite some time – 850 hours to be exact. That's 35.4 days. Over a month of pedaling. A Tesla Supercharger, Nick is not.Let's hope he doesn't want to use the Tesla's juice all in one go. Luckily for Nick, Bonanza ran for 430 hour-long episodes, so he'll only have to watch the entire series, including commercials, nearly twice. But Nick is starting to flag in the meantime we've been discussing his activities for the next month. He needs energy, and since we're not allowing him to sleep because we're cruel like that, he's going to get it through food. A lot of food. It takes about one calorie to generate one watt-hour of electricity, and since we're going to need 85,000 watt-hours of electricity (that's 85 kWh), he's going to need an extra 85,000 calories. And since Nick is going to be on that bike for 35 days, assuming he needs 2,000 calories per day as a baseline, he's going to need a grand total of 155,000 calories. Though your mother may tell you that one McDonald's Big Mac is 155,000 calories, your mother is wrong. One Big Mac, with all the fixins but with no fries or soda, comes in at 550 calories. That means poor Nick is going to have to consume 282 of those things. And how much does all of that cost? Well to normally charge a Tesla Model S, assuming you pay $0.12 per Kilowatt-hour, would cost $10.30. Not bad. But Nick is in America, powering the car with nothing but his American self, and Big Macs here cost dolla dolla bill$. According to the Economist's internationally-renowned Big Mac Index, an average american Big Mac costs $4.56. That means it'll cost poor old Nick $1,285.92. Maybe he should just stick to a regular plug. Play around with the variables and assumptions, and see what you get, and feel free to check my math. Should Nicola here be paying more? Less? Or is a Big Mac the wrong way to go?